This is a favorite here, but i decided to tweak the formula abit as i was short on whole wheat flour. To compensate for the shortage of ww flour, i increased the soaker by 20%. The dough was also fermented in the fridge during the initial fermentation for 7 hours, so i decided to add 1.5 tsp of diastatic wheat malt flour. Having almost twice the levain on hand, i decided to increase the total dough yield and bake 2.3 kg dough into 4 batards. The bread's texture, and flavor were excellent! The sour was very mild. Wow, Khalid ... Very nice loaves! Beautiful crust, crumb and nice ears. I bet those loaves don't last very long, they look really yummy! Thanks, Annie! they are every bit as tasty as they appear. Hi Khalid. VERY nice loaves here. Coincidence I just baked up some tweaked up multigrain loaves last night. Yours came out a tad bit better than mine I must say. These would be very attractive in the window of any professional street bakery. Nicely done! Enjoy these. Thanks, John :) it seems i hit the "sweet" spot with this bake. Ironically, this is one bake i went by feel alone with no numbers. 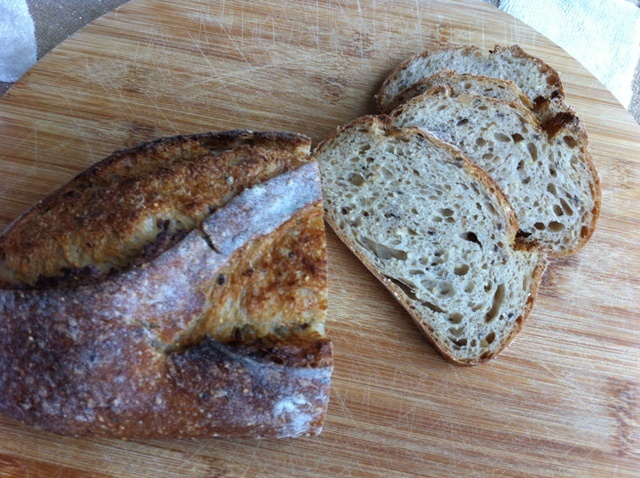 floating around in the open crumb of your too!, Beautiful examples of what bread is supposed to look like. Well done! 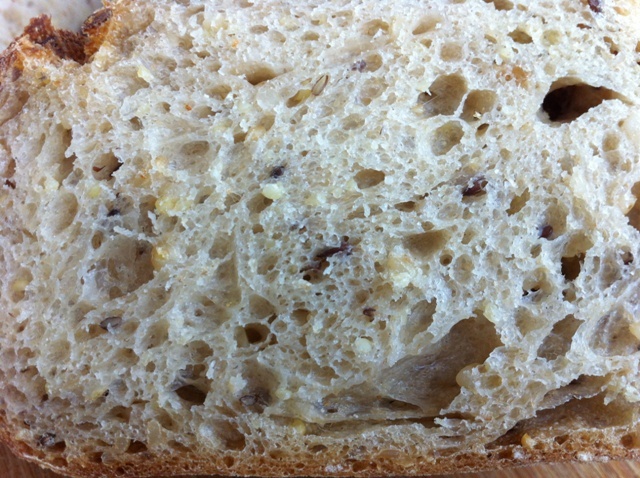 So what kind of healthy multigrains did you use for this bread and what was the hydration? They look, like John says, very professional indeed! I used cracked wheat, cracked flaxseeds, and cracked millet all in a hot soaker. I did not calculate the hydration, i went by dough feel alone. Excellent scoring and beautiful crust and crumb. Nice job all around! Those are absolutely gorgeous loaves Khalid! I bet they are as delicious as they are beautiful. Bravo! Thanks, Caroline! i guess i've hit the jackpot with this one. Khalid, even when you are "tweaking" your formulas you still bake magnificent loaves! Some of us still get into trouble when changing things up like that. These loaves look absolutely delicious! :) i believe this might be due to repetitive baking from the same formula, that made tweaking it more predictable. Great bake, Khalid. Looks nutritious and very appetizing. Thank you, Zita! You should try it some day, the formula is on TFL somewhere. I take pictures using my i-phone 4 (5 mp). Great looking loaves Khalid. Love that crust and crumb with perfect scoring. Must make a great sandwich or toast. Many thanks, Ian! You are right, it does make wonderful sandwiches and toasts. I love to follow up your posts on TFL, and others, but unfortunately my pc at work blocks pictures from your blog and all i see is a teaser. i'm at home now, and i'll see the borodinsky you made.